I took this picture of a 1933 Plymouth hood ornament during the 2011 Motor Muster held at Greenfield Village. 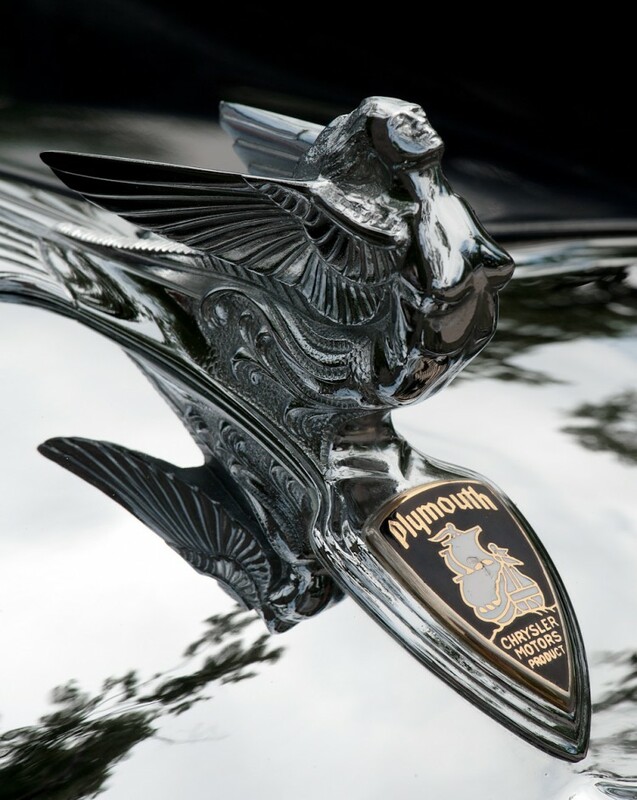 The gentleman who owned the car gave me some information on the history and evolution of Plymouth hood ornaments. The 1933 had the flying figure and by 1934 they had switched to a stylized sailing ship. The key bit of information was that the 1933 ornament actually used gold in the medallion. True or not I thought the ornament was pretty cool. I took the shot with a 105mm macro lens that I had rented. I have a couple other shots which used a more open aperture, but the field of focus was too thin. I closed it down to f16 for this shot and managed to get more of the ornament in focus. Sometimes razor thin DOF looks cool, but for this sort of shot I prefer to see more detail. Processing of the image was fairly simple. The first thing I did was give the image more of a square crop. There was too much dark space at the top of the image which didn’t really add anything of value. Similarly there was a dark corner in the bottom right that also didn’t really add anything. After cropping I used a HSL layer in Photoshop to remove some of the green and blue from the reflections of the trees and sky on the hood and used a layer mask to restore the color to the medallion. In general when I’m shooting cars outside, I’ll try to remove some of the color from any chrome. I prefer that my chrome be more silver than whatever color is being reflected in it. Stunning details! I like that bit of gold in the emblem as well. Love the details James – nice work! WOW James, that’s INCREDIBLE! Love the blog post today, too, my friend! The close crop, the elegant reflection and the exquisite detail, all keep our eyes focused on this ornament sculpture. Skillfully captured and processed! WOW! I’m crazy for hood ornaments too. I think I have made some nice images of them. But seeing this, I’m not so sure. Fantastic. Great detailed image. I love looking at these types of images for automobiles and other machines. Wonderful capture! 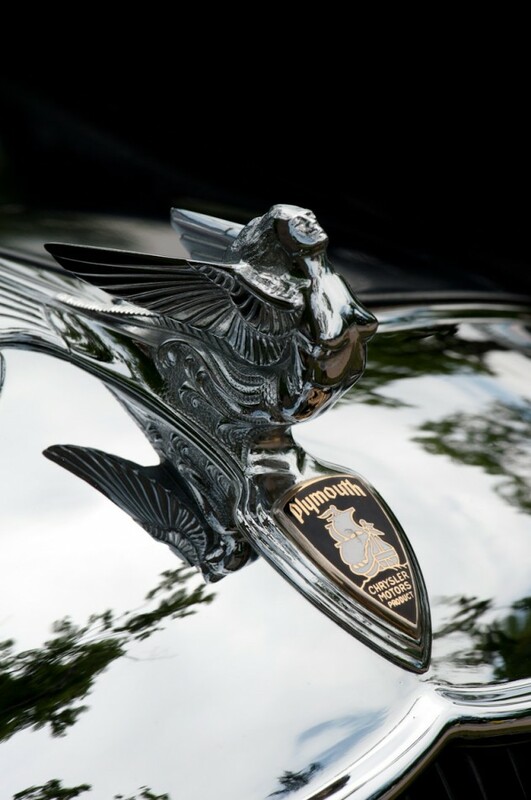 This hood ornament is often called the flying lady or winged mermaid. It was designed by American Sculptor Avard T. Fairbanks in exchange for a new 1932 Chrysler Royal Eight to use as transportation to his new job as head of the Sculpture department for the University of Michigan-Ann Arbor. Fairbanks also sculpted the very first Dodge Ram hood ornament, the Hudson Griffin hood ornament, and the Angel Moroni Statue on the Washington DC Mormon Temple. Thanks for the information. It’s always nice to learn something about the things that I shoot.